Singapore can now breathe easier as the 33rd ASEAN Summit came to a close yesterday, marking the end of its chairmanship. The second ASEAN summit of the year was a “star-studded affair” compared to the earlier one held in April. This summit saw leaders of all 10 ASEAN member states and leaders of key partner nations from outside the region including United States (US) Vice President Mike Pence, Russian President Vladimir Putin, Chinese Premier Li Keqiang and many more. Not only was this summit of a higher profile, the issues discussed were important – not only for the region, but possibly for the world too. The attendance of global leaders signalled that ASEAN is no longer just a backwater region at the periphery of Asia, but that the region plays an important role in shaping the future of global politics and trade. The role of ASEAN is even more pertinent as the world enters an era of global uncertainty. The current economic order is marred by growing threats of protectionism as seen by the tariffs introduced by the world’s largest economy, the US. There is also a growing anti-globalist movement, pressuring governments to look inwards rather than encouraging multilateral cooperation – the same movement that led to Brexit in the United Kingdom. “The international order is at a turning point. The existing free, open and rules-based multilateral system which has underpinned ASEAN’s growth and stability, has come under stress. Countries, including major powers, are resorting to unilateral actions and bilateral deals, and even explicitly repudiating multilateral approaches and institutions,” said Singapore’s Prime Minister Lee Hsien Loong in his opening remarks at the summit. Questions surrounding such uncertainty defined the entire summit. 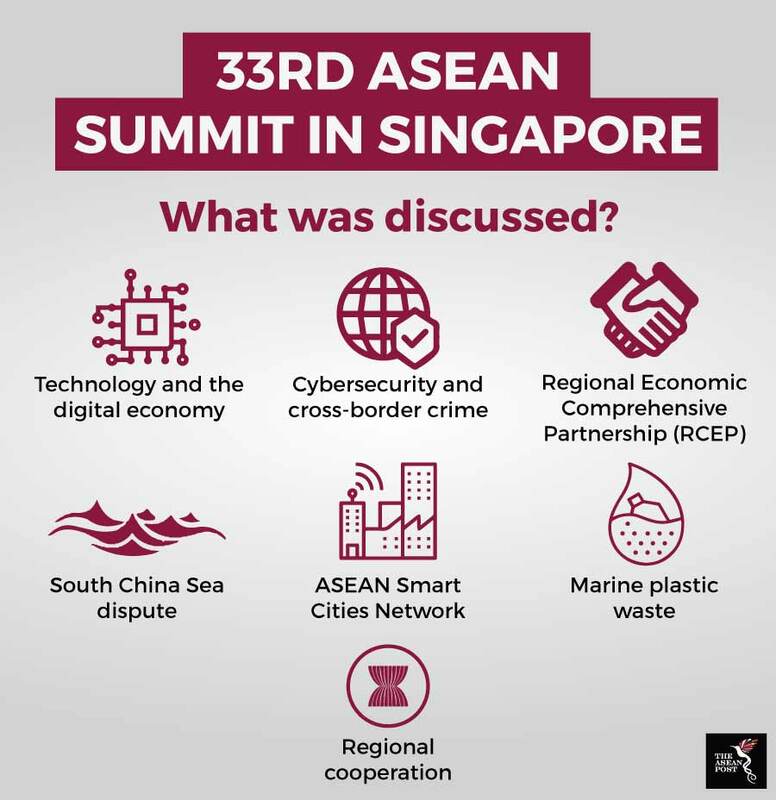 Throughout the summit, ASEAN looked to maintain its centrality and engaged with all of its key partners seeking to encourage cooperation. Among the key side-events at the summit were the various ASEAN and key partners meetings. In the ASEAN-China summit, both entities vowed to strengthen efforts to meet the joint target of US$1 trillion in trade volume and US$150 billion in investment by 2020. ASEAN and China also announced a roadmap titled “ASEAN-China Strategic Partnership Vision 2030” in a bid to bolster ties between the two. While trade was also discussed individually on the side-lines with other key partners such as South Korea, Japan, and India, all eyes were on the Regional Comprehensive Economic Partnership (RCEP) negotiations which were also carried out at the summit. The RCEP if completed could be the largest trade and investment agreement since the General Agreements on Tariffs and Trade (GATT) as it would encompass 25 percent of global gross domestic product (GDP), 45 percent of the total population, 30 percent of global income and 30 percent global trade. Many were expecting negotiations to be wrapped up this year, however it was announced at the summit that it would be delayed to 2019. Leaders at the summit however were quick to highlight that negotiations have advanced to the final stage. Another major issue discussed were the disputes over the South China Sea. For the past two years the South China Sea has become a site of contention between China and the US. China has claimed that it has a historical right to a large part of the South China Sea and began militarising and building islands there. Meanwhile, the US has been carrying out freedom of navigation missions in the area, which many say is to maintain its geopolitical interests there by keeping the Chinese in check. During the ASEAN-China summit, Chinese Premier Li Keqiang mentioned that China is expecting the Code of Conduct consultation in the disputed South China Sea to be finished soon in hopes that it will contribute to enduring peace and stability in the South China Sea. Meanwhile at the ASEAN-US Summit, both sides reaffirmed their commitment to maintaining international law in the South China Sea. “We all agree that empire and aggression have no place in the Indo-Pacific,” Mike Pence said at the summit, which many see as a thinly veiled message to China. The summit ended with Singapore officially handing over the chairmanship to Thailand. According to Thai Prime Minister Prayut Chan-o-cha, the official theme for the ASEAN chairmanship next year will be “Advancing Partnership for Sustainability”. While the Singapore summit has ended, many issues have yet to be completely resolved. Current challenges of maintaining security in South China Sea and ensuring ASEAN’s centrality will only grow. Thailand has its work cut out for next year.